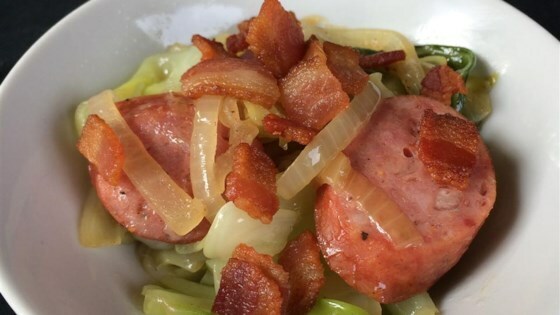 "This smoked Polish sausage dish is great for company, but quick enough for a weeknight! It is super good and easy, and can be prepared well in advance. Complete your meal by adding a baked potato, fruit salad, and bread." In a large skillet, fry bacon over medium high heat until browned, turning once. Remove bacon from pan, reserving drippings, and place on paper towels. Stir water, sugar, onions, garlic, red pepper flakes, seasoned salt, and caraway seeds into drippings. Add cabbage, and gently stir. Cover, and cook over medium heat for 10 to 15 minutes. Add kielbasa to the pan. Cook, covered, for an additional 10 to 15 minutes. Crumble bacon over top, and serve hot. My husband and I enjoyed this. The only thing I did different was I did not add the caraway seeds. It was good but definetly keep an eye on it the cabbage was a little over done for me. This is very good. Similar to what my mother use to make. I added stewed tomatoes to the cabbage this was especially great! Kids loved it.